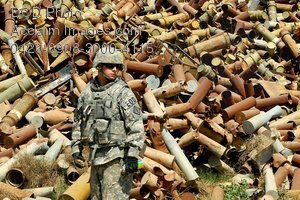 Description: Free, public domain image: Soldier, on Patrol, Standing in Front of a Hill of Scrap Metal. Sgt. Robert Solesbee, a native of Corona, Calif., assigned to 710th Explosive Ordnance Disposal Company, 3rd Ordnance Battalion, 71st Ordnance Group, glances around at his surroundings, looking for potentially dangerous ordnance among the scrap metal at the Sheik Khalid scrap yard March 18. Photo by Spc. Laura Johnso.